When Nicolette Boehland ’13, began the daunting work of documenting torture and mass hangings in a Syrian prison, she was prepared. She knew how to interview survivors of trauma. She knew how to protect the security and confidentiality of witnesses. She knew, when her 50th interview was done, just how to connect the dots. Over the course of her career, as Bonnie Docherty ’01 has emerged as an international expert on civilian protection in armed conflict, she has also mentored scores of clinical students, from field researchers in conflict zones to advocates inside the halls of the U.N. in Geneva. Her biggest alumni fans call themselves “the Bonnie mafia.” When they heard of her recent promotion to associate director of armed conflict and civilian protection at the International Human Rights Clinic, the reaction could best be summed up in one word: jubilation. 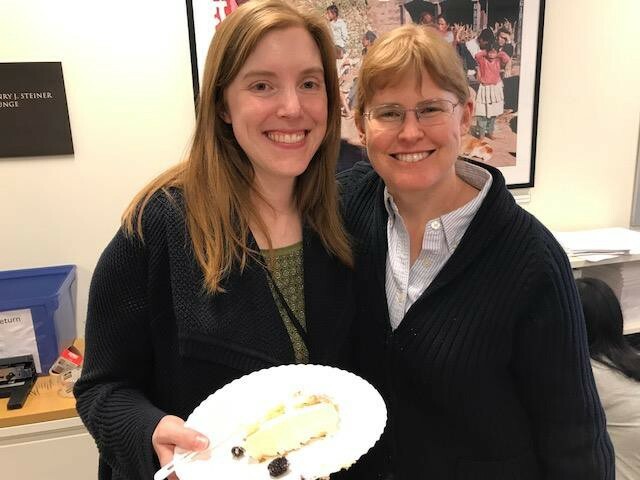 Bonnie Docherty celebrates her promotion to Associate Director of Armed Conflict and Civilian Protection at the International Human Rights Clinic. The promotion gives Bonnie room to deepen and expand her work on civilian protection. She plans to increase support for civil society organizations working in the field, create a track for students interested in careers in civilian protection, and provide a forum for experts to develop practical innovations. A senior researcher in the Arms Division of Human Rights Watch as well as a Harvard lecturer on law, she’ll continue to dedicate much of her time to humanitarian disarmament, which seeks to eliminate civilian suffering from problematic weapons. It’s an area Docherty has been working in for 16 years. Nobody is better poised to do that work. With her experience in the field, and her expertise in international humanitarian law, she is, her colleagues say, unquestionably one of the keenest legal minds in the humanitarian disarmament movement — known for her deep knowledge, her sharp legal analysis, and her strategic thinking. “If someone asks you who is the best lawyer in the world to go to on cluster munitions — and now killer robots — Bonnie is at the top of the list,” said Steve Goose, who heads the Arms Division at Human Rights Watch. Docherty never imagined this career for herself. In college, she immersed herself in the study of history, partly for the love of individual stories, convinced she would pursue a Ph.D. Then she decided she wanted to see history unfold in real time, and turned towards journalism. It was there, as a reporter for the Middlesex News, that she saw the aftermath of war up close. When the Department of Defense offered media trips to embed with the US-NATO peacekeepers in Bosnia in 1998, Docherty, whose job included covering an Army lab in Natick, lobbied her editor to go. The ten-day trip was a series of firsts: working with a translator, interviewing victims of human rights abuses, going on patrol with the military, seeing the remnants of weapons of war. Along the way, she picked up tricks of what would later become her trade — interviewing an Air Force pilot in a pitch-black cockpit, for example, scribbling her notes in the dark. “I just tried to space the notes out broadly enough, and kept flipping pages quite aggressively — and hoped,” she said. She’d applied to Harvard Law School months earlier, partly because she was tired of asking other people to answer her legal questions. In typical form, she wanted to study the source of the information for herself. Then, the week she left for Bosnia, she got the acceptance letter. And so, with the curiosity of a journalist and the long view of a historian, Docherty went to law school, studying human rights and international humanitarian law, and landing at Human Rights Watch after graduation. Her first day on the job was September 12, 2001. Over the years, Docherty has documented human rights abuses and civilian casualties in some of the world’s most dangerous conflict zones, at some of the most dangerous times, from Afghanistan in 2002 to Baghdad in 2003, three weeks after the city fell. During a fact-finding mission in Afghanistan, Bonnie Docherty ’01 gathers information on the bombing in Kandahar. In 2005, when she interviewed for the job of clinical fellow at the International Human Rights Clinic, she called in on a rental cell phone during a layover on the way to a three-week mission in Darfur. With clinical students in tow, she’s investigated the use of cluster munitions in Lebanon; documented the ongoing needs of civilian victims of Nepal’s armed conflict; and most recently, examined the use of explosive weapons in populated areas of Ukraine. From the very beginning, she thrived on the work. What Docherty saw out in the field then pushed her into another world, of diplomats and treaty negotiations. She began working intensively, often in Clinic-Human Rights Watch collaborations, to ban weapons that disproportionately affect civilians. She’s been a leader in efforts to ban fully autonomous weapons, otherwise known as “killer robots,” and to strengthen international law on incendiary weapons. Perhaps most famously, she’s known as the legal expert behind the campaign for an absolute prohibition on cluster munitions, which started as a dream, and a decade later led to a treaty. The process of improving civilian protection is slow moving and full of setbacks. To stay the course, she says, you need patience and stamina and plenty of faith. For her part, Bonnie takes inspiration from studying the patterns of history. And then there’s always her memory of that day in 2008 when almost 100 countries gathered in Oslo to sign the treaty banning cluster munitions. “It does give me patience when I’m doing all my other work to say: I know this can lead somewhere,” she said. By the time the ban on cluster munitions was signed, Docherty had been a teacher in the International Human Rights Clinic for three years. So when it happened, she had students by her side. Chris Rogers ’09, was one of them. It was a day he will never forget. 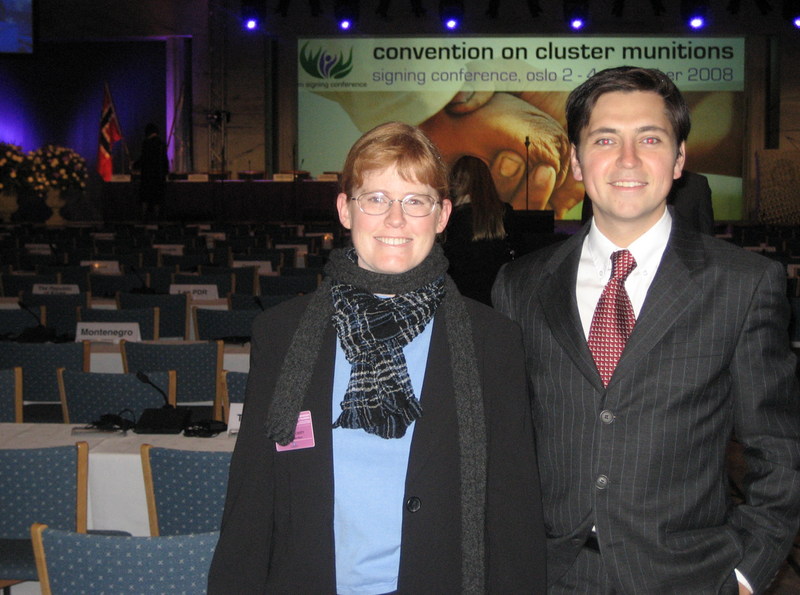 Bonnie and Chris Rogers ‘09, at the signing of the cluster munitions ban. Ask any student under Docherty’s supervision, and they’ll tell you: they learn on the job. They’re up all night with her drinking Diet Mountain Dew and parsing treaty language before a meeting of the Convention on Conventional Weapons. They’re preparing presentations on the dangers of killer robots for UN side events. Ask Ken Rutherford, co-founder of the Landmine Survivors Network and a professor of political science at James Madison University, and he’ll tell you: Docherty’s students are rock stars. “They’re singularly focused on niche areas of international humanitarian law that need to be re-evaluated, re-examined, and opened up for further discussion or refinement,” he said. By now, inside the tight-knit community of advocates that work on protecting civilians in armed conflict, there’s an expectation of excellence from Docherty. It’s just a given: Every few months, she and her students will churn out a meticulously researched publication. It will be on a topic foundational enough, or cutting edge enough, to push any given campaign forward. She will draw large crowds to her side events at international weapons conferences. And you will see in the audience so many nodding heads, as she lays out in a straightforward and compelling manner the case for what civilians need. When Docherty joined the clinic, she had eight projects, 16 students, and very little teaching experience. She was something of an introvert then, as she is now, and she wondered: Would she connect? Her colleagues in the clinic knew she would. Her passion, her dedication, and her caring caring were all contagious. Quiet and understated, she is not the kind of advocate whose voice swells when she talks about victims. Her caring comes through in other ways — in the literature she assigns her students to read, in the tributes she writes to beloved colleagues who have passed away. Almost above all, it was her humility that struck Anna Crowe LLM ’12, when she arrived in the clinic, knowing Docherty only by reputation. Crowe was prepared to be intimidated. And then, surprisingly, she wasn’t. Here was a human rights advocate who strayed so far from the stereotype in her mind. Someone who had made a career, and a community for herself, by being superb at her job, and generous. More than a decade after she began teaching, the “Bonnie mafia” now stretches far and wide, roughly 40 alumni strong. Some work in government. Others at law firms. Many have moved into the fields of disarmament, or civilian protection, or other areas of human rights advocacy. Many owe their first job to her, and often, the job after that. To them, Docherty’s influence cannot be overstated. Those words come from a letter several alumni wrote to the senior leadership of Harvard Law School a few years ago, calling attention to the ways in which Bonnie prepared them to practice law, and strengthened the contributions they would make to the world. It gave Bonnie goose bumps to read it. She’d never heard some of those stories before. When she was promoted this spring, she got to hear it all again, in notes that came from all corners of the country and the world. It’s something far more than praise to her; it’s a gift.